After deciding to learn about the JVM, I started reading the JVM specification. I felt the need for trying out few things on my machine to get some practical idea about what the specification tries to tell. I am currently reading the Chapter 2: The Structure of the Java Virtual Machine. Here is what I got to learn. This means that the entire specification is an abstract and anyone could implement their own Java Virtual Machine in their preferred programming language. I also googled to see for an already existing implementations of the JVM and found this list. Garbage collection algorithm used in the JVM. Now, that we know some scope of what to expect, I moving forward. The class file format seems to be pretty big deal. I used to do Java long time back (mostly in college) and I vividly remember using javac and java. The javac stands for java compiler. We input a java source code file into javac compiler and it produces a .class file, which we give as input to java program, which will then run our code. It is good that I remember this much. At this point, I am curious to note the contents of a simple .class file. So, let me write a Hello world program in java and use javac to compile the source to a .class file. Well, I am pretty intrigued at this point if I could make some sense out the of class file by writing more simple programs and comparing the class file contents. Calculate.class contains the following content. I could see the presence of our member methods of the class and some letters that my editor could not render. My guess is that they are instruction codes and they would refer to the methods being called. Anyway, we will get to know about this better in the upcoming chapters. So, let me move on. Here are some pictures from the clojure getting started guide, that potrays what I just did. Also it is worth noting this statement that is present along with these pictures. 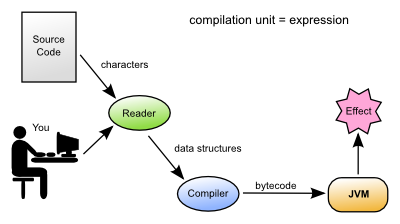 In Java, source code (.java files) are read as characters by the compiler (javac), which produces bytecode (.class files) which can be loaded by the JVM. It refers to what I called .class file all throughout my little expedition as bytecode. OMG! So this is just it. Bytecode is not a buzz word to me anymore. I think, the weird characters that my editor could not render are just bytes of data, that represent the code I wrote. Pretty good theory, huh? Well. Lets see where this goes!